Tim Cooper, Commander & Historian of John D. Long Post #58, American Legion, Buckfield, ME, is a descendant of the Story family of Vermont, and has a photo album originally belonging to Daniel L. C. Colburn, pictured right. Colburn was born around 1833, the son of Daniel and Anna Colburn, of Burlington. 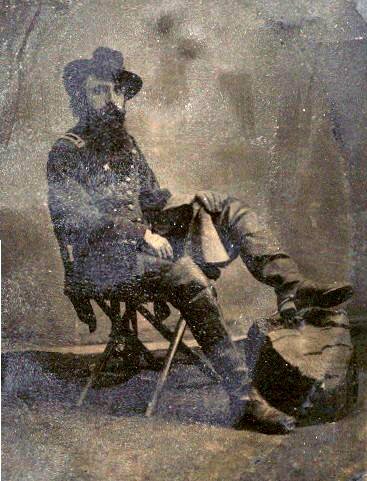 He graduated from the University of Vermont School of Medecine in 1862, and at age 30 was commissioned Assistant Surgeon, 5th VVI, on 18 August 1863. He mustered out 29 June 1865. He died 6 June 1877, and is buried in Walnut Hill Cemetery, Baraboo, Wisconsin. The majority of the photographs are from the 5th Vermont. Several of these photographs have not surfaced in other collections to date. There are still a few to be identified. It is appears that Dr. Colburn put the names on the back of many of the pictures, and probably at a much later date, probably explaining the mis-identification of O. L. Spencer as Bronson, the wrong initials for Rosalvo Howard, and the difference between Kavaney and Kavanaugh. He also missed Orvis Sweet's date of death by almost two week.